MILLINGTON, Tenn. -- If Saturday is all about the sportsman world championships, then Friday night was all about welcoming Memphis' hometown boy back home. 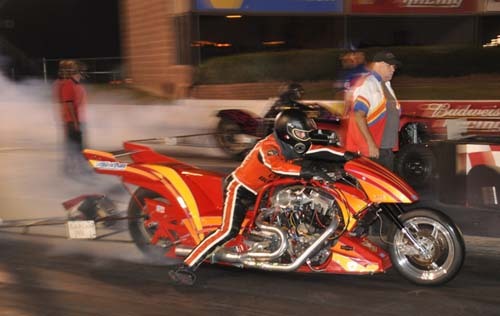 Clay Millican, from right down the road in Drummond, Tenn., made his first career quarter-mile drag racing pass at Memphis International Raceway many years ago and on Friday, Millican returned to the track that launched his legendary career. And in that return, the six-time IHRA Top Fuel World Champion, world record holder and multi-time national event winner returned to IHRA's winner's circle for the first time since 2007 with a win over longtime rival Bruce Litton during opening night of the IHRA Summit Racing Equipment World Finals. "It is such a joy to return to the place where it all started," an excited Millican said. 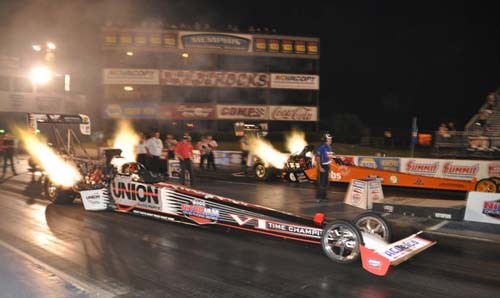 "I was so excited to put this deal together to come race with the IHRA this weekend. To be able to race right here at home, to sleep in my own bed and see all of my friends, family and fans all while getting to race is such an awesome deal. I want to thank Bruce for letting us use one of his cars, we are just sorry we had to beat him with it!" Millican joined Friday's other pro winners, Mike Minick in AMSOIL Prostalgia Nitro Funny Car, Chris Smith in Nitro Harley and Ron Hope in Fuel Altered, while IHRA's sportsman racers received their first hits at the track in anticipation of Saturday's two championship races - the Summit Tournament of Champions and Summit SuperSeries. Millican produced Friday's two quickest passes, recording a 4.799 in round one before barely edging Litton in round two with a 4.768 elapsed time at 306.81 miles per hour. Litton actually had the advantage at the line in the final, but the Indianapolis native couldn't keep pace as he ran a 4.846, 307.30 pass in the runner-up effort. In AMSOIL Prostalgia Nitro Funny Car Mike Minick had two easy passes right down broadway in the "Chi-Town Hustler" machine to take the win in the popular flopper class, easily besting Mike Halstead and the "Candies & Hughes" Barracuda in the final. Minick had a 5.847, 241.97 in taking the win while Halstead ran into trouble on his run and had to shut it off. In Fuel Altered Ron Hope traded win lights with Kyle Hough, saving the most important win for last in taking the "Rat Trap" to a 6.478, 211.83 to Hough's swerving 6.782, 166.25 in the final. 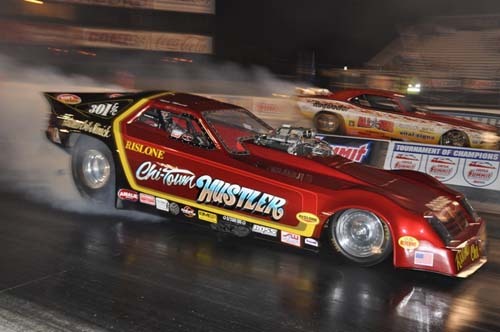 Saturday's Summit World Finals will conclude with two more rounds of Nitro Jam professional drag racing culminating with the sportsman world championships in the Summit Tournament of Champions and Summit SuperSeries races.